UNV East and Southern Africa office organized the first VConnect event to discuss pathways for climate action in Africa through innovative volunteerism in late 2018. VConnect is a series of innovative initiatives and conversations aimed at connecting volunteerism with key development issues. Volunteerism strengthens civic engagement, safeguards social inclusion, deepens solidarity and solidifies ownership of development results. 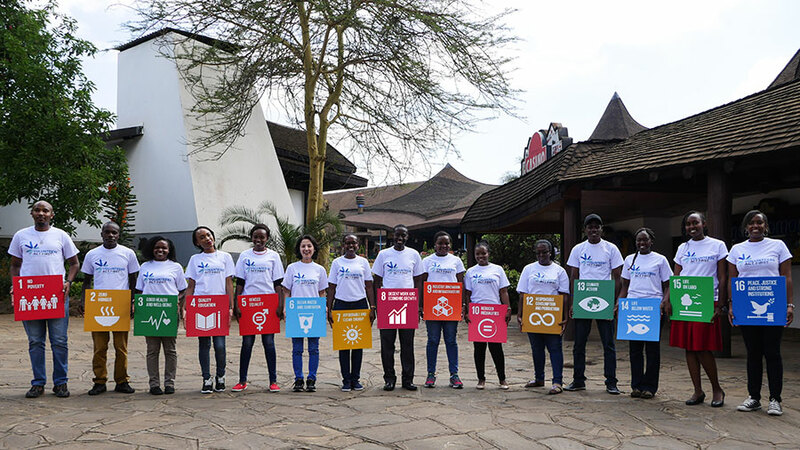 UN Volunteers raise awareness of the Sustainable Development Goals, and engage people at the grassroots level in development and peace, so that no one is left behind. Currently, Africa’s population stands at almost 16 per cent of the world’s total population. By 2050, the United Nations projects that Africa will account for half of the world population growth. Sub-Saharan Africa currently only captures 55per cent of its human capital potential, compared to a global average of 65 per cent. With more than 60 per cent of its population under the age of 25, Sub-Saharan Africa is the world’s youngest region. The continent’s working-age population is set to increase to over 600 million by 2030. Africa’s public infrastructure urgently needs to be enhanced and millions of new jobs need to be created. The continent must leverage on its people, and the multiplicity of the skills, talents, initiatives, creativity, energy & networks they represent in the diversity of sectors they engage. These should be the building blocks for stimulating Africa’s next development phase. Africa must focus on maximizing productivity of its catalytic sectors. These are economically inclusive sectors in which the region holds a comparative advantage in resources and which can mitigate carbon and build ecosystem resilience simultaneously. Being one of the most resource rich regions in the world, Africa has all the ingredients necessary to provide the largest food basket for the rest of the world. Innovative volunteerism leverages skills, talents and experiences for mutual and public benefit. In the context of increasingly complex development challenges facing Africa, coupled with the population bulge, innovative volunteerism is critical in harnessing the youthful energies in the continent in tackling these development issues. Finding synergies and addressing challenges in a collective and inclusive way provides opportunities for all. Innovative volunteerism is really the pathway in achieving these synergies. Socio-economic issues affecting Africa are urgent – the necessity for creating jobs for an increasingly youthful population, ensure food security and expanded economies. Climate action through innovative volunteerism offers a ready solution. The window of opportunity to harness this solution is however very small and action is needed now.